It’s actually short for umm, er, “Twenty-WATT Church”… yeah, that’s the ticket! 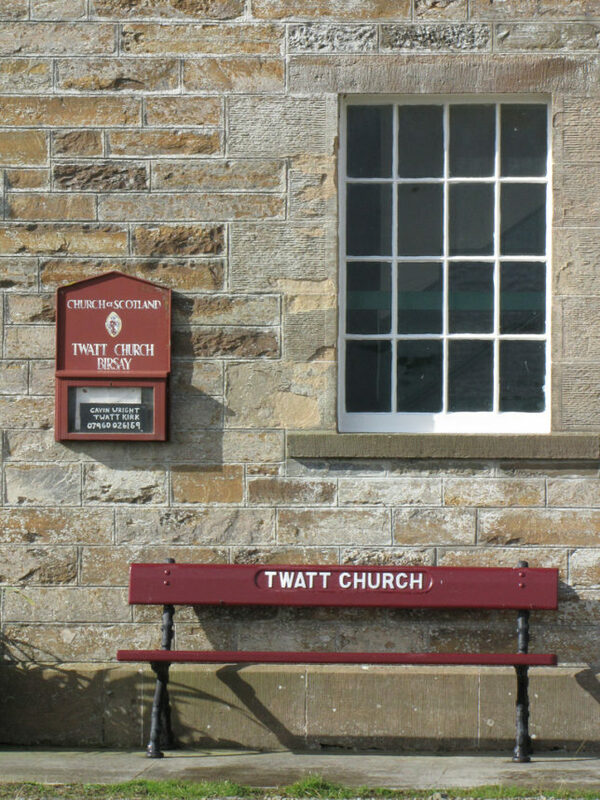 Or maybe not: both the wall-mounted signboard and the bench out front really do read “Twatt Church”, which likely means younger congregants have an even tougher time holding back the snickers during mass. Flickr member ladyjaypeg captured the pseudo-salacious sanctuary in Scotland’s scenic Orkney Islands on September 12th of 2010. 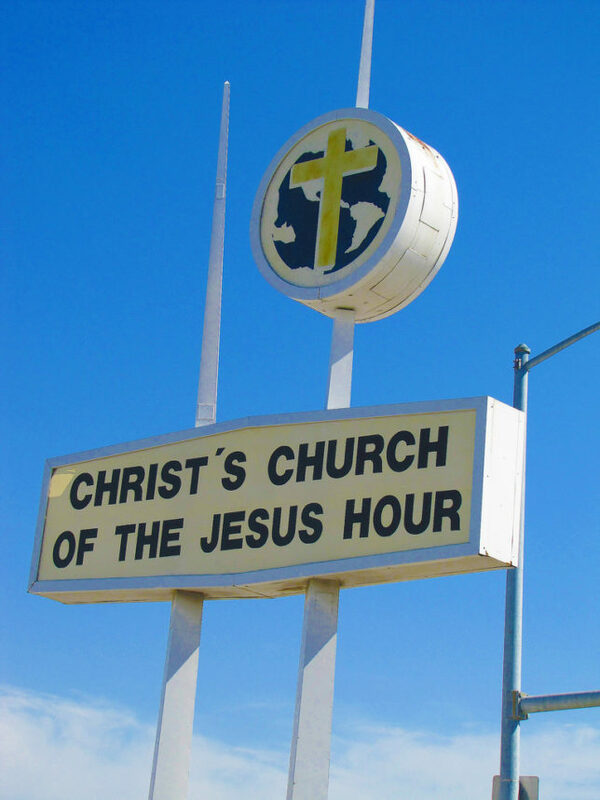 It would appear time’s up for Christ’s Church of the Jesus Hour, a fundamentalist church located at 18th and State streets in Kansas City, KS, according to Flickr member jimsawthat, who saw that sign in April of 2010. The recently-closed church’s thought-provoking name begs the question: is this a church or a TV show? Why not both? 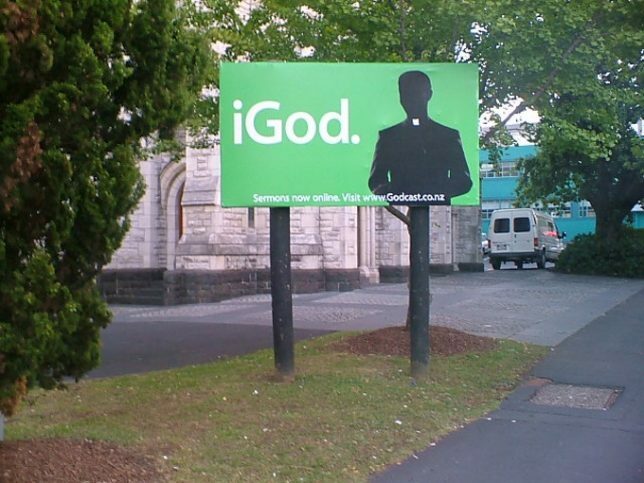 Can I get a Godcast on my iGod? Yea brothers, sisters and fanbois, ye can! At least ye COULD, according to the above photo Flickr member jarsenaultj posted in January of 2007. Now, it seems that “this site can’t be reached” and the “server IP address could not be found”. Guess we’re just not praying hard enough… and we need to try turning our computer OFF and back ON again. 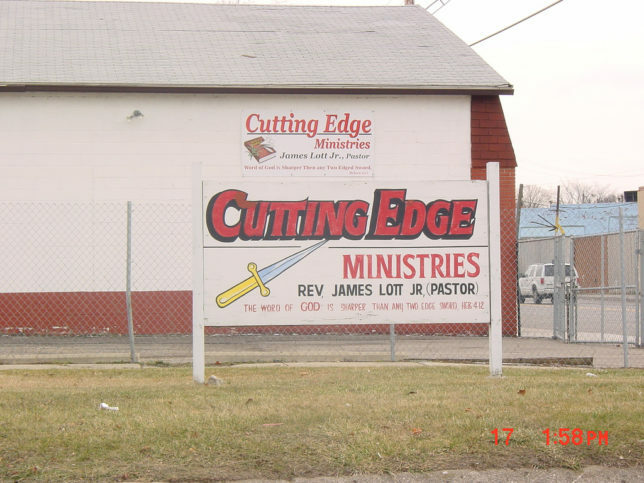 You’ve gotta be tough to make it in Detroit these days, and that goes for churches as well as church-goers. Sharp-eyed Flickr member ts48203 snapped this li’l “slice” of inner city life back in 2009. The violent name, btw, refers to a verse in Hebrews 4:12, KJV that reads “For the word of God is quick, and powerful, and sharper than any two-edged sword,” so they’ve got that going for them, which is nice. Oh, and please check your weapons at the door. 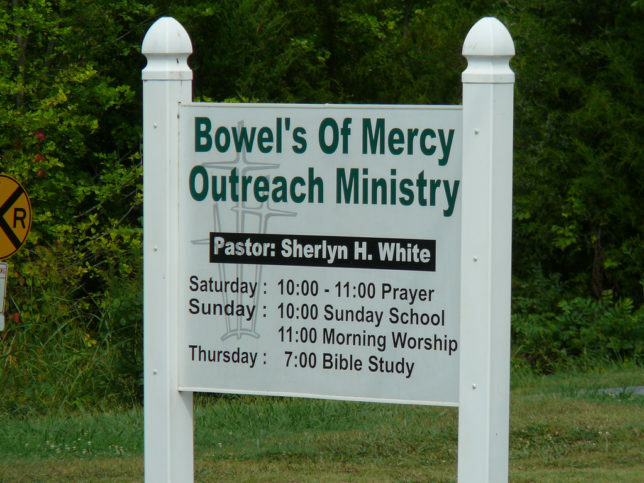 A superfluous apostrophe may be the least noisome issue at this North Carolina congregation – try to avoid those three-bean-salad-fueled Sunday potlucks. Praise the Lord and pastor the Renuzit! Flickr member grahamguync snapped this church signboard from Siler City, NC in August of 2009 but religiously refrained from comment, unlike us. We knew there had to be a reasonable explanation for this outwardly odd signboard, and we found it: passage 17:7 from Third Nephi, the eleventh subdivision of the Book of Mormon, reads in part, “Have ye any that are lame, or blind, or halt, or maimed, or leprous, or that are withered, or that are deaf, or that are afflicted in any manner? Bring them hither and I will heal them, for I have compassion upon you; my bowels are filled with mercy.” Keep that in mind and be ready to quote it next Sunday… when you answer that dreaded knock on your front door.